Can an Improved Debt Collecting System Prevent Effective Scam Enforcement? What is the IRS impersonation scam? A person receives an unsolicited phone call from a live person or from an automated call dialer who claims to be talking on behalf of IRS. The caller may use a fake name or may not use name at all, or can also provide a fake IRS employee’s badge number. The alleged IRS representative may know the victim’s Social Security Number or other personal information of the victim. The caller tells a targeted victim that he or she owes taxes to the IRS and if this person does not respond and pay them immediately, the victim will be arrested or sued. There also can be threats such as the loss of a business or driver’s license or deportation. The impersonators often use the technique called spoofing when they use voice-over Internet protocol technology to hide their real phone numbers behind real IRS phone numbers. Thus, when a person tries to call back that number, the individual is redirected to a real office of IRS. The impersonators often ask the victims to use prepaid debit cards, wire transfers, Western Union payments, or MoneyGram payments. As recent as April 2016, the impersonators started to demand the payments in Apple iTunes gift cards. Between April 2016 and October 2016, between 70 and 80 percent of all payments to the impersonators were made through Apple iTunes gift cards. Moreover, in August 2017, the IRS informed the public that impersonators had moved to the e-mail domain. The impersonators started sending phishing emails pretending to work for the IRS and the FBI, urging victims to complete a fake IRS or FBI questionnaire. By clicking the link to that questionnaire, victims downloaded a ransomware that locked their data stored on the device until they paid a ransom to the impersonators. In October 2016, an IRS scam call center operation in Mumbai, India, was raided by local authorities to uncover that the center produced between $90,000 and $150,000 per day for more than a year. The center produced $33 million to $55 million for that year, and it was targeting U.S. taxpayers. The Treasury Inspector General for Tax Administration (TIGTA) had stated prior to the incident that it knew of 5,500 U.S. taxpayers who lost approximately $29 million, dating back to October 2013, because of the scam operation. The TIGTA Deputy Inspector General for Investigations stated in August 24, 2016 that his agency received 1.5 million complaints and recorded almost $47 million stolen from 8,000 victims. The Department of Justice has been actively trying to prosecute the IRS impersonators, and, in 2016, it successfully prosecuted two individuals tied to Indian scam call centers. One of the individuals, Kaushik Kanti Modi, has been convicted of money laundering charges under 18 U.S.C. Section 1956. Modi bought store-value cards which were subsequently loaded with the scam proceeds and used to buy money orders to deposit into bank accounts. The second individual, Sahil Patel, has been sentenced to 175 months in prison for racketeering, extortion, and aggravated identity theft due to his involvement in India-based scam call centers. A new piece of legislation may create an obstacle to an effective way of prosecuting these kinds of impersonation scams. The Fixing America’s Surface Transportation (FAST) Act (P.L. 114-94) requires the IRS to use private debt collectors for certain types of debts. The private debt collectors are first required to contact a debtor by a letter and, only after the letter, can the private collectors contact the debtor by a phone call. It has been argued that this could help IRS phone impersonators to deceive more people, as the IRS has historically emphasized that it does not directly contact people by phone to notify them of their debt. With a new debt-collecting mechanism that arguably differs, this would not be so clear anymore. 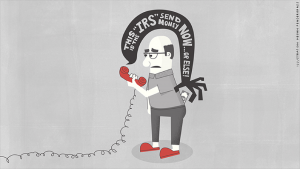 The proponents of private debt collectors have been claiming that people who do owe taxes are, first, notified by a letter, and once they receive a call, the call would already be expected. If a person would receive a phone call prior to a notification letter, he or she could understand that it is a scam. However, it can also be argued that the people who have been notified by a letter would expect a phone call and, thus, may let their guards down once they receive a fake call from IRS impersonators. These issues were addressed in the deliberations regarding the private debt collector requirement, and the proponents of private debt collectors claimed that the IRS would have time to address that issue prior to putting a new amendment into a full operation. One of the safeguards proposed was to publicly identify private debt collectors so that general public would be able to discern a scam debt collector from a real one much more quickly. Another argument was made that a proper protocol could ensure that the usage of private debt collectors would not make taxpayers more vulnerable to these kinds of scams. Congress has been closely monitoring the issue and bringing up specific problems associated with private debt collectors and impersonating scam operations. The IRS has also been consistently updating its website with all necessary information to inform and warn the general public. Having this scrutiny gives hope that private debt collectors can effectively take on some IRS responsibilities without affecting the U.S. taxpayers’ safety, but only time will tell whether this can be the case. Grassley Letter Raises Impersonation Scam Enforcement Questions, Tax Notes Today (Apr. 11, 2016), https://www.taxnotes.com/tax-notes-today/fraud-civil-and-criminal/grassley-letter-raises-impersonation-scam-enforcement-questions/2016/04/11/g462. IRS Impersonation Scams Have Victimized Thousands, TIGTA Says, Tax Notes Today (Feb. 16, 2017), https://www.taxnotes.com/tax-notes-today/criminal-violations/irs-impersonation-scams-have-victimized-thousands-tigta-says/2017/02/16/gdmc. Emily Frye & Gregory Staiti, Hold the (Internet) Phone! The Implications of Voice-over-Internet Protocol (VoIP) Telephony for National Security & Critical Infrastructure Protection, 1 ISJLP 571, 585 (2005). IRS Impersonation Scams Have Victimized Thousands, TIGTA Says, supra note 2. IRS Issues Urgent Warning to Beware IRS FBI Themed Ransomware Scam, IRS (Aug. 28, 2017), https://www.irs.gov/newsroom/irs-issues-urgent-warning-to-beware-irs-fbi-themed-ransomware-scam. Indian Call Center Raid Sheds Light on Scope of IRS Scam Calls, Tax Notes Today (Oct. 7, 2016), https://www.taxnotes.com/tax-notes-today/fraud-civil-and-criminal/indian-call-center-raid-sheds-light-scope-irs-scam-calls/2016/10/07/g988. Maryland Man Pleads Guilty to Scheme Involving IRS Impersonation, Tax Notes Today (Mar. 22, 2016), https://www.taxnotes.com/tax-notes-today/criminal-violations/maryland-man-pleads-guilty-scheme-involving-irs-impersonation/2016/03/24/g3pd. Pennsylvania Man Sentenced for Call Center Tax Fraud Ring, Tax Notes Today (Jul 8, 2015), https://www.taxnotes.com/tax-notes-today/criminal-violations/pennsylvania-man-sentenced-call-center-tax-fraud-ring/2015/07/09/fw8s. Fixing America’s Surface Transportation (FAST) Act, Pub. L. No. 114-94 § 32102бб, 129 Stat. 1312 (2015). Tax Scams / Consumer Alerts, IRS (last updated Aug. 29, 2017), https://www.irs.gov/newsroom/tax-scams-consumer-alerts. Grassley Letter Raises Impersonation Scam Enforcement Questions, supra note 1. Collection Agency May Not Be Protecting Taxpayers, Lawmakers Say, Tax Notes Today (Jun. 23, 2017), https://www.taxnotes.com/tax-notes-today/collections/collection-agency-may-not-be-protecting-taxpayers-lawmakers-say/2017/06/26/1rbxs.